Featuring series 2013 $2 notes from the Federal Reserve Banks of New York and Atlanta with matching serial numbers beginning with 2018 and a commemorative engraved print of the back of the Series 1918 $2 Federal Reserve Bank Note which features the central vignette of the "Battleship — New York," the collection launched today, Aug. 14, at 8:00 a.m. Eastern Time for $49.95. The bureau is offering discounted pricing of $45.95 when quantities of 10 or more are placed. 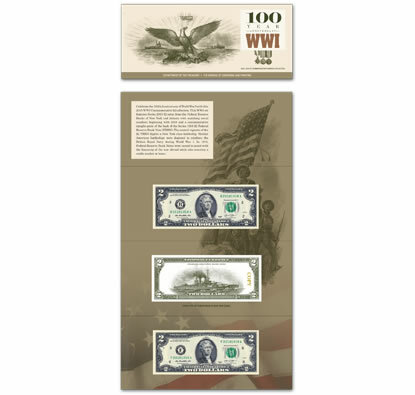 The Bureau of Engraving and Printing’s main mission is to develop and produce United States currency notes. The agency prints billions of Federal Reserve Notes each year for delivery to the Federal Reserve System. These notes are produced at facilities in Washington, DC, and Fort Worth, TX. So is design on the back of this bill only able to be purchased through this release?